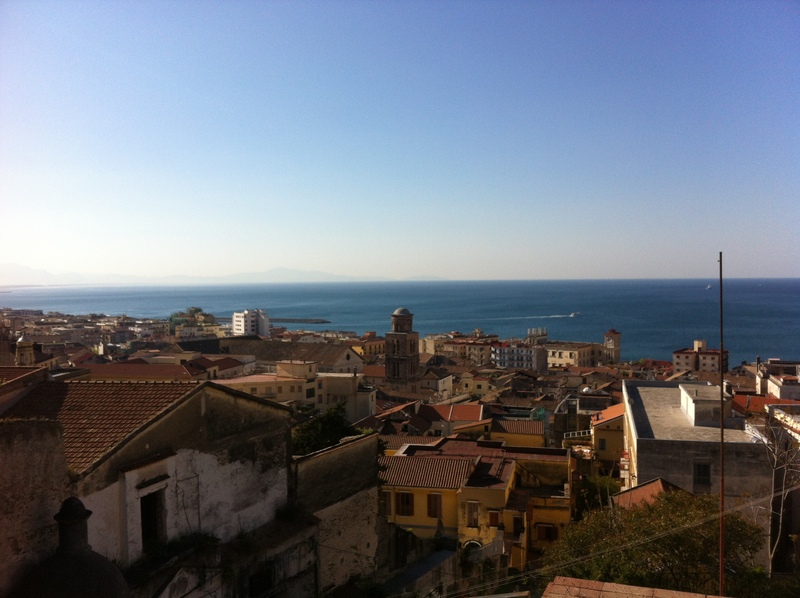 It’s been a week of first experiences here in Salerno. The first of the first things that happened is something I’ve been dreading and looking forward to for the last five years. Dreading in the sense that I would have to say goodbye to precious people in my life and put them in someone else’s hands. Looking forward to in the sense that I would be able to do some things I haven’t been able to do alone or at all for the last five years…you know like go to the bathroom without someone yelling at you from the other side of the door that they couldn’t get the PlayDough lid off or find their Captain America costume. If you haven’t figured it out by now, this happened this week. 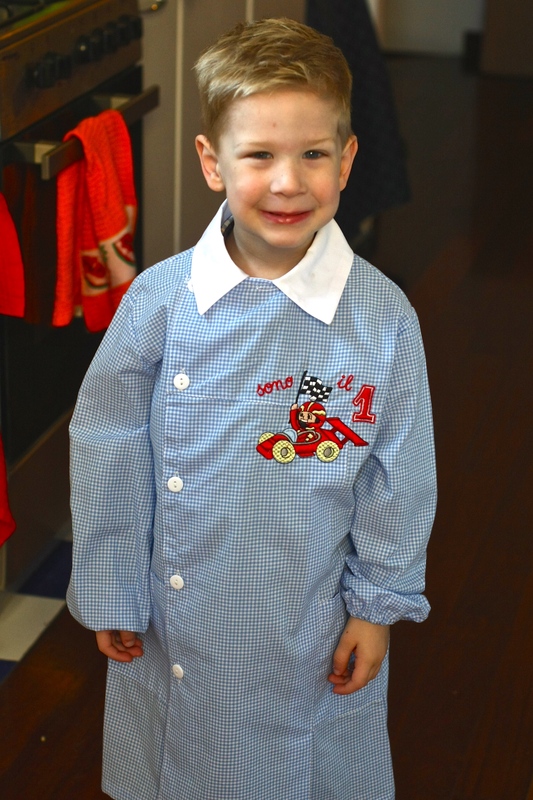 We dressed our kids in their grembiules (school apron), strapped on their backpacks and set off for the uphill climb school. I was somewhat nervous the whole way up. I was sending them into an environment where they would not know anyone and would not be able to communicate with the exception of gesturing. And to top it all off, I had to say goodbye to the little people you have filled my every moment for so long. 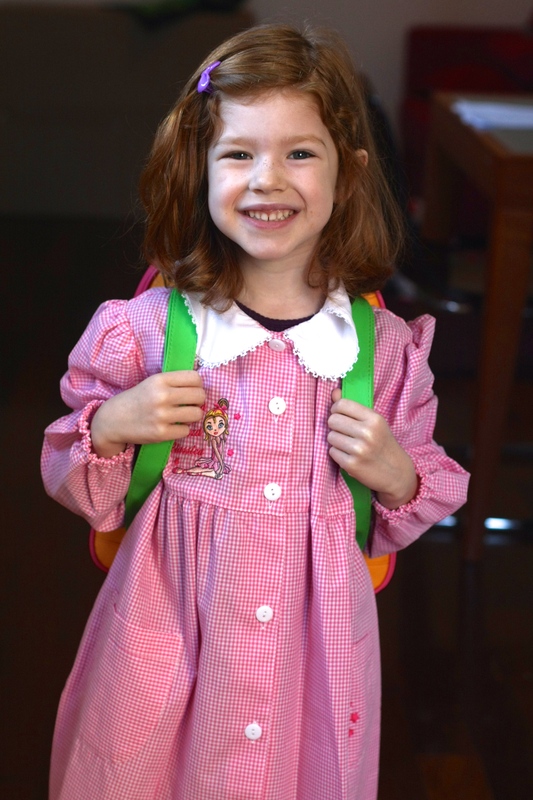 I have never envied parents on the first day they send their kids to school. Just the thought of it in the past has left my face tear-stained. Friends were praying for them and me. As we approached the door, the inevitable lump began to swell in my throat. We walked up the steps and to my surprise one of the administrators opened the door, greeting us with a smile…and she spoke in ENGLISH!! Monica walked us to the kids’ classroom, introduced us to the teacher, Katarina, and helped us get the kids settled. We trusted that God would take care of them in a very difficult situation. I left the school crying a little but feeling ok about the people with whom I had just left my children. Paul left the school captivated by the view, and well, who could blame him. 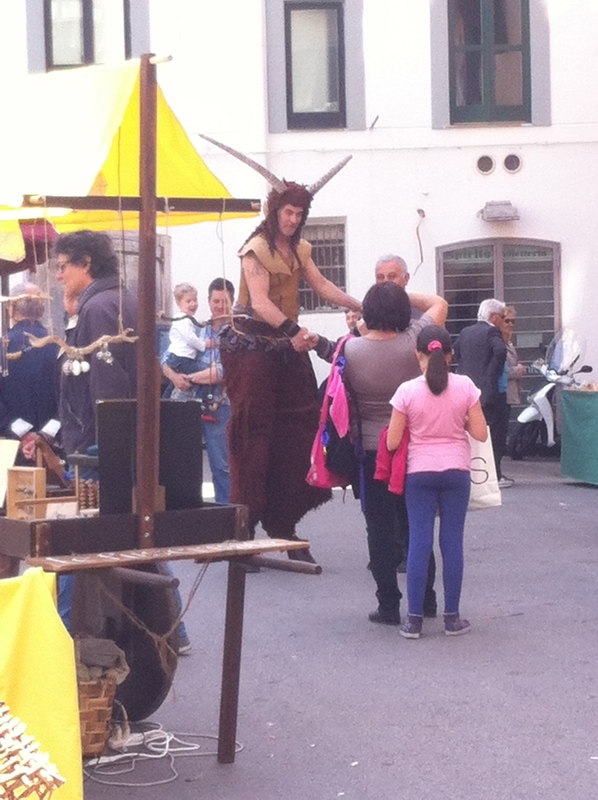 The second of the first things that happened was that we saw the creature in the below photo walking around at the medieval festival. Have you ever seen a giant faun walking around? I turned looking for Peter, Susan, Edmund and Lucy running from the White Witch. I’m not sure if the third of the first things that happened this week is more or less significant than the first of the first things that happened this week. So I’ll let you be the judge. 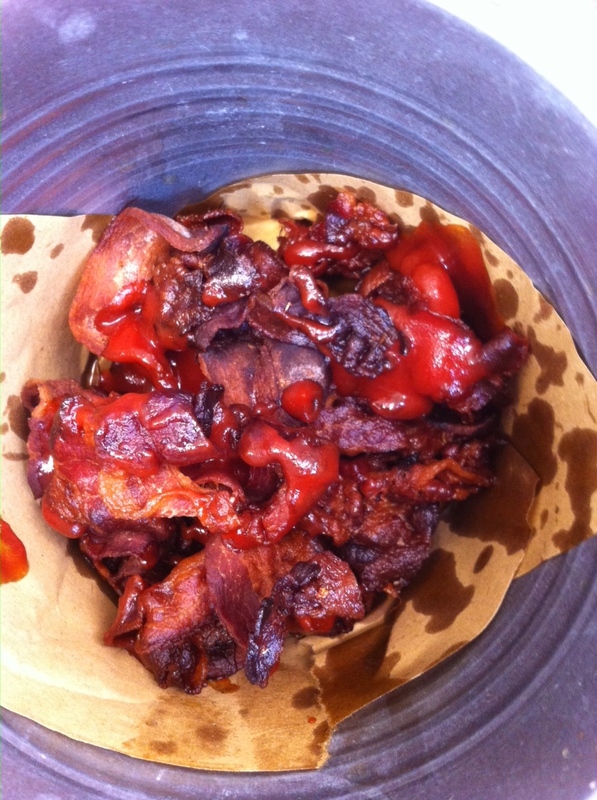 This, my friends, is a bucket of bacon doused in BBQ sauce. Pick yourself up off the floor, rub your eyes, and realize that this actually happened. There is a burger joint here that has as a menu item Bacon Fritte – or fried bacon. The description suggests that it is tempura fried bacon. Well, being good Americans, we had to try it. What we got was a bucket of bacon with BBQ sauce. Now, I have lived in the south the majority of my 34 years, and I have NEVER had someone bring me a bucket of bacon. That’s not to say I haven’t eaten the same amount of bacon let’s say at the Shoney’s breakfast bar, but this was above and beyond anything I have ever experienced. Maybe it’s because I haven’t had bacon in over a month. The BBQ sauce took it to a new level. Do yourself a favor, go fry up some bacon and pour some of your favorite BBQ sauce on it. You’ll thank me. So do you see why it’s hard to decide if the first or third thing was more significant? Of course I’m joking. 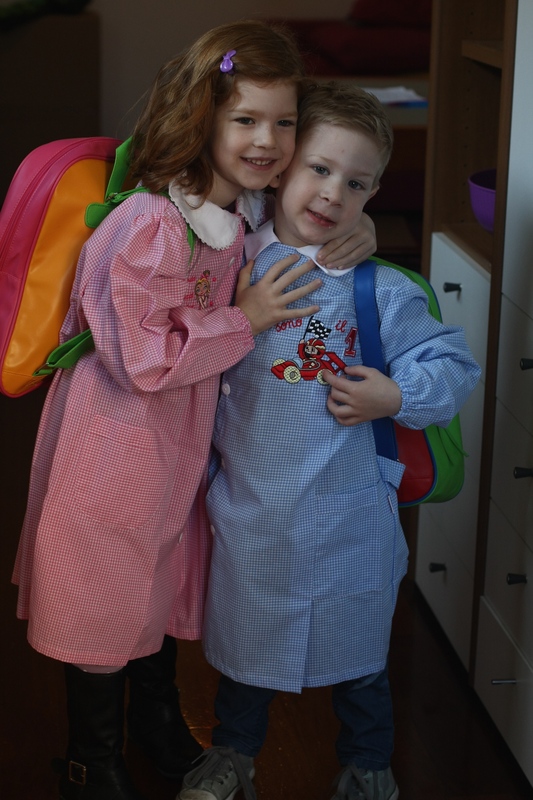 The two most precious little people in my life started school this week. That trumps all the other first.